Blake Morant, the law school's dean, announced Monday that he will step down at the end of the semester and go on sabbatical before returning to GW as a faculty member. When Blake Morant arrived at GW more than four years ago, he set his sights on building up the law school’s national stature. Now, just about three months away from his last day, the outgoing dean has improved the school’s national rankings, academic curricula and relationships with faculty, law school professors said. Morant announced Monday that he will step down as dean at the end of the semester and go on sabbatical before returning to GW as a faculty member. As he finishes up his tenure, Morant said he hopes law school students, faculty and staff will continue to promote respect and maintain a sense of community. After leading Wake Forest University’s law school for seven years, Morant jumped into a position in 2014 that had been without a permanent leader for about 18 months. He became GW’s first black law school dean and brought expertise in media and administrative law from his experience as the president of the Association of American Law Schools. 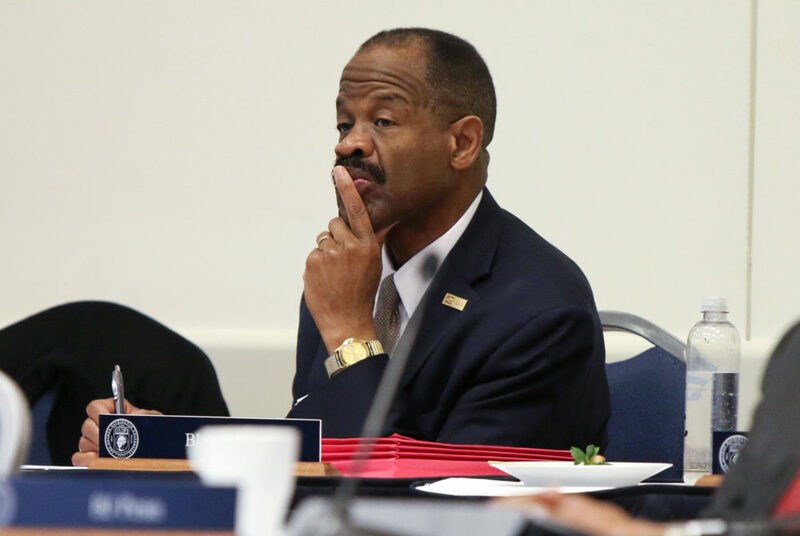 Morant is now the fifth dean of a school to leave GW since University President Thomas LeBlanc began his tenure in August 2017. The leaders of the School of Medicine and Health Sciences, the School of Engineering and Applied Science, College of Professional Studies and Columbian College of Arts and Sciences all departed over the past 13 months. “I am confident that the law school will continue on its upward trajectory and wish my successor every success in elevating GW Law to new levels of excellence,” Morant said. But Morant said he was also challenged during his tenure as “the legal academy and higher education in general grappled with a watershed of changes exacted by a global and rapidly changing economy.” He said the school also struggled as the number of “highly qualified applicants” fell and officials fought to maintain a positive reputation in the face of “unprecedented” budget cuts. Officials enacted a series of budget cuts in 2014 after graduate enrollment slumped unexpectedly. Miriam Galston, an associate professor of law, said the dean managed to trim more than $7 million from the school’s annual budget during his tenure. She said he directed a series of faculty focus groups during the budget cuts to receive input on finance management, which helped alleviate “pain” the school experienced. “The dean was always quick to praise the faculty’s accomplishments, and he set the tone for a prolonged period of collegiality among faculty members, productivity and a communal sense of responsibility for the many administrative tasks that result from shared governance,” Galston said. Robert Tuttle, a professor of law and religion, said Morant has been supportive of and listens to faculty suggestions, especially during the law school’s recent effort to revamp its first-year curriculum. Tuttle served on a faculty working group that Morant created two years ago to advise on the changes, which are the first updates to the curriculum in more than 30 years and are slated to go into effect this fall. Morant said there is “not really” anything he would have liked to accomplish during his tenure that he did not, but he added that he hopes faculty and administrators will continue to review and revise the school’s upper-level curriculum after implementing changes to the first-year program. Jonathan Turley, a professor of public interest law, said Morant assumed the role at one of the “most difficult” times for the school in the midst of a changing environment for legal education, which included a steep decline in applications to law schools nationally. Under Morant’s tenure, the school decided in 2017 to enroll fewer students to prevent a downfall in U.S. News and World Report rankings. Turley said Morant has left a “deep” foundation for future growth at the law school but added that Morant’s successor should prioritize working with the University to enhance fundraising endeavors to ensure the school maintains its high national ranking. The law school clocks in at No. 24 on the U.S. News and World Report annual rankings. John Banzhaf, a professor of law, said Morant has been a leader who shaped the law school’s curriculum and established initiatives like the George Washington in New York Program, where second- and third-year law students serve as interns in New York and take courses on law and business. But he said Morant did not properly handle a student conflict last semester in which the president of the Student Bar Association allegedly made an insensitive comment about the Jewish Law Student Association. The dean offered mediation sessions to help resolve issues between the SBA and JLSA, but some students said the effort only aimed to avoid bad publicity. “He should not have interfered with the handling of this matter by our law students who are mature adults who study negotiation, mediation and other methods of resolving disputes,” Banzhaf said. Ali Kingston, the president of the SBA, said she is grateful for Morant’s dedication to the law school community, especially during student orientations for incoming law students.